In collaboration with the Victorian Cancer Registry (VCR), the Biobank has conducted an exercise to compare VCR coded entries with the VCB assigned codes in the Cresalys database. The study was undertaken to investigate the feasibility of linking fields contained in the VCR database with the fields in the Cresalys database. 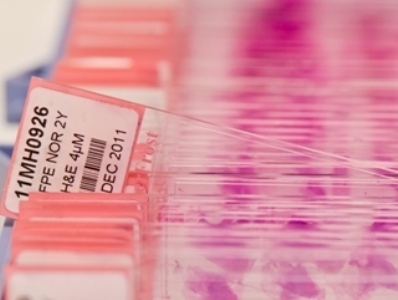 Currently Biobank staff enter data obtained from pathology reports into Cresalys. This data is also coded by the Data Managers at the VCR. Pathology data from 493 cases was extracted from Cresalys and from the VCR database. This included all records dated the month of June 2011 as well as a random selection of cases from each Biobank site entered between January and June 2011. The extracted data was compared and evaluated for accuracy and correlation. The results indicated strong correlation between the coding used in both databases. However, the error rate of approximately 11% in Cresalys data underlines the importance of the coding being undertaken by VCR staff with expertise in this area. The Biobank Data Managers are now using data retrieved from the VCR to clean the data currently held in Cresalys. The Biobank looks forward to collaborating with the VCR to commence the process of linking data fields with the VCR, which will reduce the current duplication of resources and improve the accuracy.